In my last entry I mentioned that I won the only two contests I've ever entered. Two of hundreds of contests available to me. However, I regret that I seem to have overlooked a number of awards I've won professionally, but those really aren't photo contests so I don't feel like I've mislead anyone. For instance, the very first award I ever won was the Printers Industry Association Of America (PIAA) Gold Award for Best Cover. 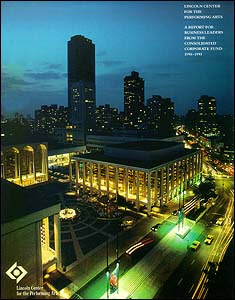 It was my first high-profile job, an Annual Report for Lincoln Center for the Performing Arts and... yeah, I won. There have been others as well and I'm not going to bore you with the details or toot my own horn. Suffice to say they weren't, strictly, photography contests. Anyway, I'm still ticked off about that Microsoft thing. I last wrote about the Microsoft sponsored, "Future Pro Photographer" contest and my objection to the rule granting all rights to Microsoft and its fellow sponsors. Needless to say, I wasn't the only one to take offense and very shortly thereafter ASMP had worked a deal with Microsoft amending Rule #5. ASMP is a great organization and I'm in awe of its ability to intervene to get the rule changed. * It now says: "As a condition of accepting a prize, you agree to grant Microsoft an irrevocable royalty-free worldwide license to reproduce and display the image, credited with your first and last name, in print and on the web for the purposes of only promoting this contest." This is a good start, but that's all. "8. CONDITIONS OF PARTICIPATION. .....By entering this Contest You agree to and hereby release and hold harmless Sponsor and Administrators from any and all liability or any injuries, loss or damage of any kind arising from or in connection with this Contest, use or license of your Entry, or any prize. If you do not want to grant the foregoing release, please do not enter the Contest.... (and continues after some other qualifiers to state)..... You waive any claim of infringement (including without limitation copyright, trademark, patent, trade name, trade secret, etc.) against the Sponsor and Administrators or their licensees based upon access to or use of your Entry." Hellooooo??? Doesn't Rule #8 say that Microsoft and its pals can break Rule #5, use your images anyway and be immune from litigation? I'm no lawyer, but it sure seems that way to me. *Okay, I'm biased, I'm President of ASMP's New Jersey Chapter. Joseph Pobereskin is a former advertising, corporate and editorial photographer, known for his environmental portraits, scenic and industrial images. His commercial and editorial assignments have taken him around the world and have led to publication in more than 60 countries. He's also presented seminars in the Apple Pro Sessions series of workshops at the flagship Apple Stores in both New York City & Chicago. Having retired from the photo biz, he has turned his attention to securing the Chicago area’s finest homes. As an account executive for ADT Custom Home Services, Joe works out of the Chicago corporate office of ADT Security Services but serves the unique security needs of clients all over the United States. A specialist in ADT Pulse Interactive Solution and CCTV surveillance systems, and with friends from the mailroom to the board room, Joe’s clients include a mix of professional athletes, former diplomats, CEOs and other highly visible people, as well as folks from all walks of life. This is a Flickr badge showing items in a set called Master Image Files. Make your own badge here. Copyright © 2006-2017 Joseph Pobereskin, All Rights Reserved.